Network Insight for Cisco® Nexus, a feature of Network Performance Monitor and Network Configuration Manager, provides deep insight and extensive visibility into the health and performance of your data center infrastructure. Get visibility into your virtual Port Channels (vPCs). View config snippets to see config details specific to that interface. Easily identify ACL config changes, and filter, search, and view ACLs including object groups. Get Virtual Device Context (VDC) support to detect parent and children and choose options for monitoring. A failure or configuration error in your data center network can often mean disrupted productivity and lost revenue. SolarWinds® Network Insight for Cisco® Nexus provides deeper visibility into the devices at the heart of your network, giving you the information you need to quickly spot issues, fix them, and maintain redundancy to meet your high uptime goals. Help ensure service availability by monitoring thousands of physical ports. Isolate and resolve Virtual Port Channel issues with automatic relationship mapping between VPC, port channels, and physical ports across both switches in your VPC domain. Get complete monitoring and backup for every Virtual Device Context, and navigate between them with one click. Review interface configs alongside performance metrics. Maintain configuration consistency and security with compliance policies. Back up and keep a history for every ACL. Filter, search, and view ACLs, including object group membership. Quickly identify overlapping rules and shadow rules to help you optimize access lists typically in seconds instead of hours. 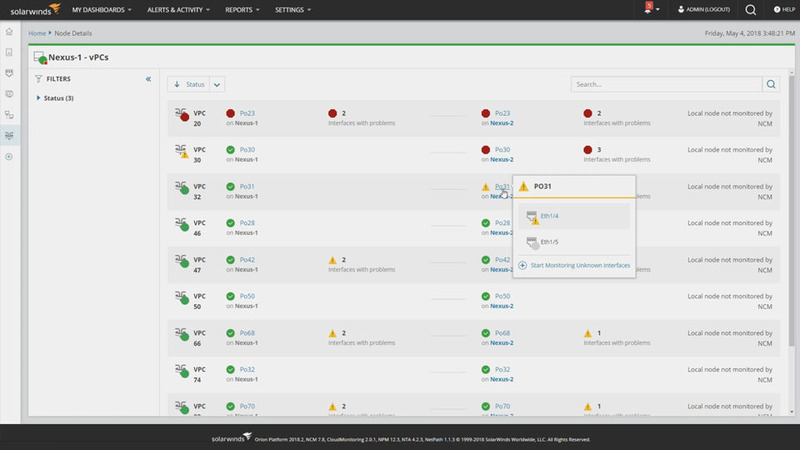 Gain complete visibility with Network Insight for Cisco Nexus, a feature of SolarWinds Network Performance Monitor and Network Configuration Manager.